If you have any questions or suggestions you are welcome to join our forum discussion about Further Talk on Pullbacks. There are different types of pullbacks according to their extent and they generally occur in a sequence from the shallowest to the deepest as the trend progressively weakens. You can have a one-bar pullback, a pullback to a minor trend line, a pullback to the moving average and a pullback to the major trend line. There can be more than one of each type, but they tend to occur according to the market movement’s decisiveness, i.e. in a very strong trend, especially in its early unexhausted stage, it is not typical to see pullbacks to the major trend line, while one-bar pullbacks are common. 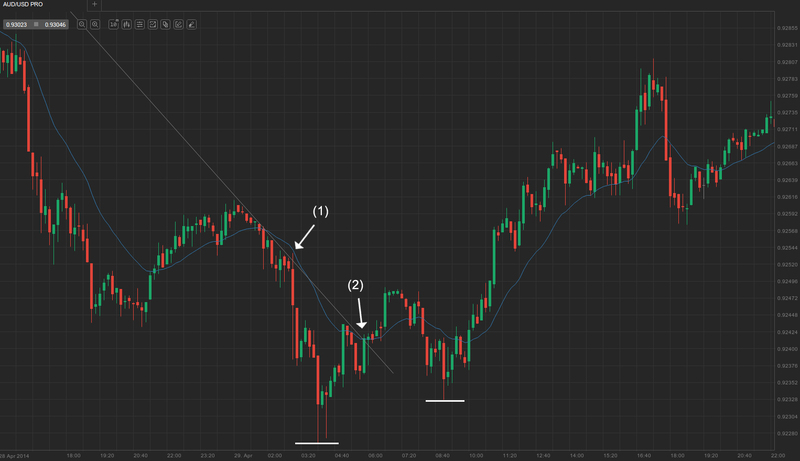 As a pullback occurs for the first time, it will be the initial one for that type. Most of the initial pullbacks are small and part of the trend’s first leg, but each subsequent pullback generally becomes deeper. Subsequent pullbacks are commonly followed by a test of the old extreme, which is most often exceeded. Moreover, as a type of smaller pullback occurs, it is followed by the larger varieties, because sentiment among the counter-trend traders improves, while with-trend traders begin to lock in profits, instead of scaling in into their positions. After a trend has begun, the first pullback is most often a one- or two-bar pullback, which is commonly followed by a rally to a new high (or a plunge to a new low in a bear trend). The next pullback may be a one- or two-bar one as well, but is usually a deeper one. As the trend progresses, the next type of larger pullbacks will develop and at some point the price will break a minor trend line and then accelerate back to a new trend extreme. You can see an example below. As you can see on the screenshot above, the market entered a strong bearish trend after a climactic exhaustion of the previous bull trend. 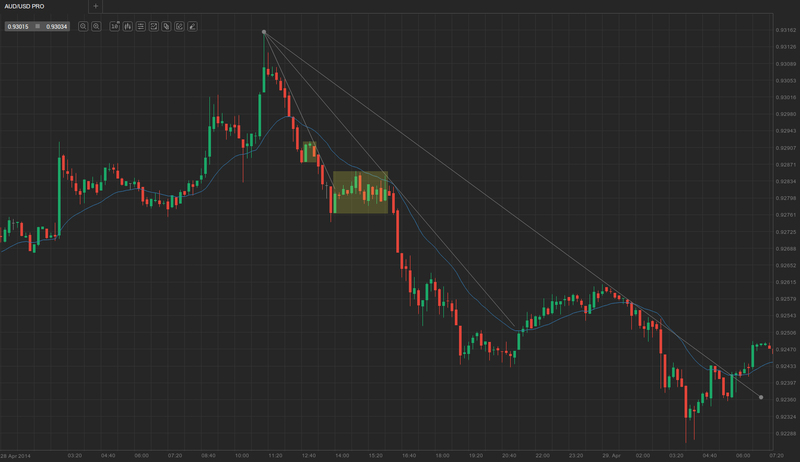 There was a small pullback to a minor trend line, after which the price broke the most recent swing low. A prolonged pullback followed to the next minor trend line. As we know, pullbacks are not necessarily counter-trend moves, they can also be only trading ranges. Upon reaching the minor trend line, the market fell to a session low. It is possible for the price not to touch the moving average for more than 15 bars during a strong trend, but once it pulls back to the MA, it will commonly provide a good with-trend setup that will lead to a test of the trend’s extreme and may even penetrate it. Sometimes the price will not only break the moving average, but also form a gap bar (a bar whose high is below the moving average in a bull trend, or its low is above the moving average in a bear trend). Usually such a pullback is also followed by a rally to a new trend extreme. At some point, the market will do a strong counter-trend move that will break the major trend line (in many cases its the same move that formed an MA gap bar), which will be followed by a test of the latest trend extreme as well. However, because this is the most significant type of pullback, which indicates that counter-trend traders are becoming increasingly stronger, it is very likely that the test of the old extreme, even if successful, will be followed by a strong two-legged counter-trend move or even a reversal. Each pullback before this reversal should be considered as a with-trend entry signal, because it is expected to test the previous extreme and even exceed it. This is exactly what happened at the end of the trend, which was pictured above. Take a look. You can see that the market pulled back to the major trend line and repeatedly retested it. 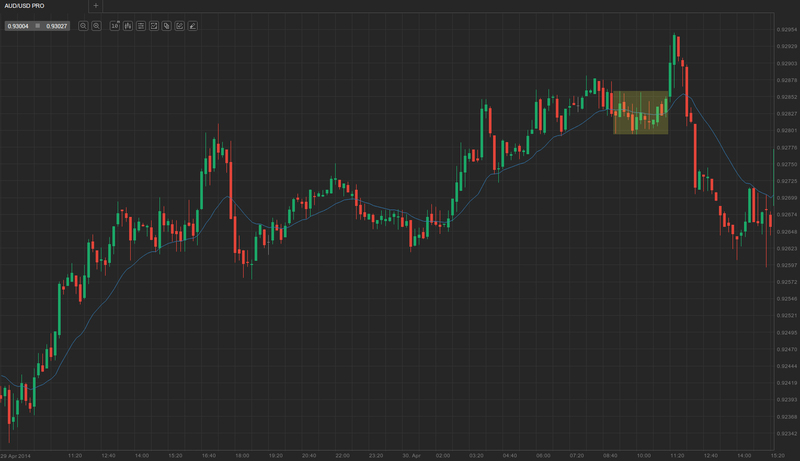 As it finally managed to overshoot it at bar (1), it fell to a new session low with a small two-bar pullback in between. The price pulled back to the major trend line and the 20-day EMA and managed to penetrate both of them at bar (2). 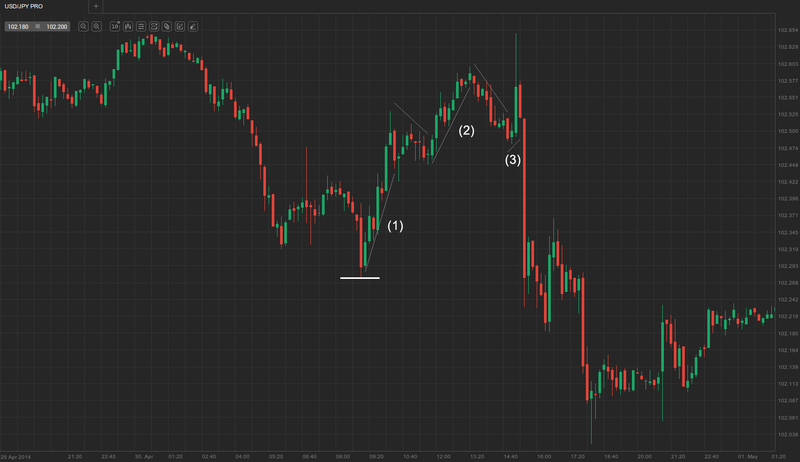 The move continued and formed five consecutive gap bars. Usually, after this the market is expected to accelerate to a new trend extreme (in our case session low), after which it commonly enters a trading range, or a two-legged correction or reversal comes. In our case, it fell short of breaking the previous session low, but nevertheless reversed up afterwards. Moreover, if the market had already formed a number of pullbacks and entered a late small trading range within the trend, you should proceed trading with caution. These trading ranges have the potential to trap with-trend traders, because they occasionally accelerate toward a final extreme, followed by a trend reversal. Generally, when such a trading range is present, in a bullish trend for example, you can go long at its bottom, if there is a suitable entry signal. However, you should avoid placing buy orders on an upward breakout, because other bulls might decide to take profits at the new high, while bears short, thus leading to a trend reversal after the final extreme. Check the screenshot below. You can see that a strong protracted trend, which had already pulled back several times over more than a day, entered a “barbed wire” trading range closely after marking its new extreme. As you already know from the article “How to avoid one of the biggest wallet drainers”, barbed wire is very tricky to trade and best to be avoided. Nevertheless, in our case, if a trader would want to trade it, the only decent entry would be to go long at the bottom of the trading range and avoid going long on a with-trend breakout, because that might be too close to a possible trend reversal or at least a two-legged correction after a trend extreme is hit. Sometimes, pullbacks might not have two counter-trend moves, rather three, which traps counter-trend traders, because they expect the third leg to be a new trend. Although this happens most of the times, there are of course exceptions. In some cases, strong trends have three-legged pullbacks, which however lack strong momentum and traders take advantage of that. As the price pulls back, market participants typically place with-trend entries at each new low in a bullish trend, or new high in a bearish one. Check the screenshot below. On the example above you can see that the market fell to a session low, followed by a three-legged pullback. The price corrected with three pushes up, (1), (2) and (3) and the respective minor with-trend legs between them, before the bear trend resumed after it tested the session high, falling to a new extreme. As soon as the third leg began, counter-trend traders were trapped in, thinking that the second minor with-trend leg would mark the end of the pullback and the next move will be the beginning of a new trend, which it usually is, but not this time.